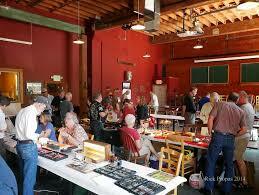 Vancouver Pen Club: Report on the 2014 Portland Pen Round-Up! 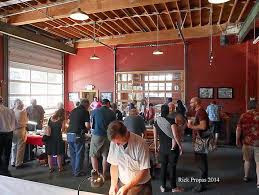 Report on the 2014 Portland Pen Round-Up! 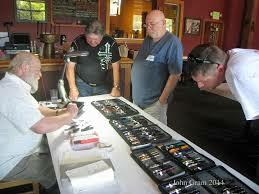 Three members of our Vancouver Pen Club (Brian, Dave M and Aaron) attended the 2014 Portland Pen Round-Up! which was held on July 12th, so I thought it would be of interest to our members to post a report written by Round-Up! co-organizer Michael McNeil of the Portland Pen Club. The Portland event is the closest thing to a mini pen show in the Pacific Northwest, and it's a good opportunity to meet other pen people, as well as buy, sell & trade writing instruments. There are plans for a 2015 Round-Up! and I will post info about it here when I get the information from the show organizers (probably not until next year, though). The 2nd Annual N.W. Pen Round-Up! was held on July 12th in Northwest Portland, Oregon. Everyone seemed to be enjoying themselves and the pens and there was quite a bit of commerce going on. I enjoyed the event. Part of my fun is finding pens to buy and I bought quite a few fountain pens and a couple of mechanical pencils. I know others were buying pens as well. 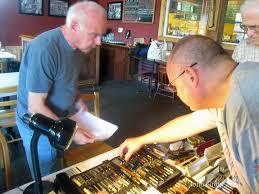 Some of us found pens and mechanical pencils the day before, at the antique show. I met quite a number of people who attended, that I had some long discussions with them, and felt like I spent most of the day talking. It was very good to see longtime friends, also. Rick Propas and his wife Sharon were here in Oregon on vacation and touring around parts of the state. Another friend, from the San Francisco Bay area, came by for a time and I was quite surprised to see her! A couple of our friends from British Columbia brought pens and sold at the event. It looks like we will plan to have the 3rd Pen Round-Up! In 2015. We would like to invite everyone reading this to attend, whether you live in the Northwest U.S. or not! Rick has posted articles and some fantastic photos of their trip here to Oregon. I would like to thank Rick, John Gram and John Schwab for the use of their photos taken at the N.W. Pen Round-Up! We would also like to thank Pen World International for donating a large stack of the June edition of Pen World magazines. I would also like to thank all of those who helped with advertising, getting the word out and made the event come off without a hitch, especially Stuart! Also thanks to Mike Rosen, who originally had the idea and gave it a name! Photo below, from L-R: Show co-organizer Michael McNeil, Beau and his father Bud (both from the Seattle Pen Club) and Rick Propas. 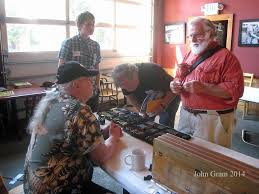 Photo below, from L-R: Show co-organizer Stuart Hawkinson, Dave M. from our Vancouver Pen Club, Portland Pen Club member Ron Church, and an unidentified gentleman. 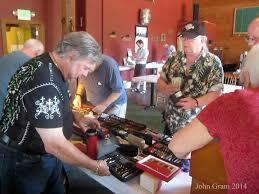 Photo below: VPC member Dave M. peruses the wares for sale. To see more photos from this year's event (and some from 2013's), go to http://s1208.photobucket.com/user/MacPenz/library/Pen%20Round-Up?sort=3&page=1 and click on individual photos to enlarge. Many thanks to Michael for the show report, and to Rick Propas, John Gram and John Schwab for the photos!